In addition to not guilty and guilty, juries had the power to choose from several variations on these verdicts, which could have important consequences for the punishment of those convicted. The defendant was accused of killing the victim, but the jury concluded the death was accidental, or "by misfortune". This verdict was often used when death was caused by the accidental discharge, or by a traffic accident. See also chance medley and manslaughter. This was an acquittal verdict dictated by the trial judge, usually on the grounds that one of the parties had failed to prove the case involved a matter in law. Defendants could argue in their defence that they were not responsible for the crime, owing to the fact that they were not of sound mind, and therefore could not be held responsible for their actions. In order for this argument to be accepted, the defendant had to have a total lack of reason and understanding, and be entirely unable to understand the difference between right and wrong. If this argument was accepted juries delivered the verdict of "non compos mentis". Concern that people discharged as a result of this verdict would commit further offences, led to the passage of the "Act for the Safe Custody of Insane Persons Charged with Offences" in 1800, which specified that those acquitted should be kept in custody at his Majesty's pleasure. In the nineteenth century the standards applied in cases involving mental derangement became less rigorous. For example, it became acceptable to argue that even if a crime was rationally planned, the defendant might still be found not guilty if he was unable to understand right from wrong. In a small number of such trials medical testimony was provided. A new category of guilty but insane was introduced in 1800, and allowed juries for the first time to find a defendant guilty who they nevertheless considered insane. See also unfit to plead. This verdict was used in those cases where the prosecution failed to offer any evidence to support their case against the accused. See also Prosecutor not Present. This verdict resulted in the defendant being acquitted because there was an inaccuracy in the way the indictment was written or the offence was charged. The case could not proceed because the victim of the crime did not appear to testify against the defendant. See also No Prosecution Evidence. The defendant was accused of a killing offence, but the jury concluded the killing occurred in self-defence. This verdict is sometimes expressed using the Latin phrase 'Se Defendendo'. This verdict was rarely used, jurors instead normally preferred to find the defendant part guilty with a verdict of chance medley or manslaughter. This is a verdict created in 1800 following the passage of the "Act for the Safe Custody of Insane Persons Charged with Offences". It acknowledges that the defendant's actions were a product of their insanity, but unlike the non compos mentis verdict (which effectively acquitted defendants on the grounds of their insanity), it affirmed their guilt. In the process it created a new category of "criminal lunatic". According to the 1800 Act, those defendants found guilty but insane were to be kept in custody "until his Majesty's Pleasure shall be known". There is a significant increase in the use of this verdict from 1885. In this instance the jury convicts the prisoner, but recommends that the convict should be treated with mercy. This verdict was used in cases where the offender was particularly young, or possessed of a good character, or where the crime was a first offence, or no violence was intended, or where the offender had a large family to support. More rarely, the jury recommended a specific punishment, such as whipping or transportation. In addition to the simple verdict of guilty, evidence is sometimes provided that the defendant had in fact pleaded guilty. In these cases, no trial took place. In some instances defendants confessed to only part of the charge by pleading part guilty. In capital cases, where the convict might be sentenced to death, the court discouraged such pleas. Hearing the full circumstances of every case allowed judges to use their wide discretion in choosing an appropriate punishment. With the declining use of capital punishment from the 1820s, however, a guilty plea became more acceptable, indeed desirable. The court was dealing with a large number of cases, and this plea simply saved time. Juries often found the defendant guilty of a reduced offence, such as theft of goods of a lower value. Such partial verdicts reduced the punishment convicts were likely to receive by allowing them to claim benefit of clergy (abolished in 1827). This was a very desirable outcome in a system in which, until the reforms of the 1820s, many people were charged with crimes punishable by death, while jurors and judges only wanted to see a limited number of people hanged. In many cases the reduced value of the goods was blatantly implausible, but the jury engaged in such "pious perjury" with broad judicial and public support in order to save lives. On the search pages, these verdicts are all treated as subcategories of guilty verdicts. This verdict was originally used in murder cases where the killing did not involve premeditated malice (as in a sudden fight). It was used in preference to not guilty, however, because the killer was believed to be at least partially to blame. In the late seventeenth century it was used most frequently in cases of deaths caused by accidents (such as being run over by a cart or a gun going off unintentionally) in order to indicate that the defendant was not at fault. The verdict in these cases is also sometimes recorded as "acquitted". Other defendants in similar circumstances were found not guilty by virtue of accidental death. In the eighteenth century the verdict of Chance Medley was used to indicate that although the defendant was at fault, he or she did not have any evil intention. The verdict was, however, rarely used (and never after 1731), and in such circumstances those involved were more likely to be convicted of manslaughter. See also self-defence. The jury could find the defendant guilty of a lesser offence to the one with which they were charged. Cases of burglary, housebreaking, shoplifting, and robbery, all of which carried a death sentence, were occasionally recorded as a simple theft; leaving the judge free to waive execution in favour of a lesser punishment. A defendant charged with murder could be convicted of manslaughter if the jury felt that the killing was unlawful, but not premeditated. Deaths which resulted from fights, duels, the legitimate disciplining of servants and wives, and accidents often resulted in this verdict. However, some accidental deaths, and some deaths which occurred when the perpetrator was acting in self-defence, resulted in other verdicts. See chance medley, accidental death, and self-defence. Until 1827, defendants found guilty of stealing goods worth 40 shillings or more from a dwelling house were subject to a mandatory sentence of death. By reducing the value of the goods below 40 shillings, juries could avoid this statutory penalty. 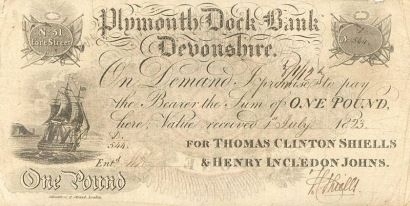 In 1827, the threshold value was raised to 100 shillings and this verdict became redundant. In 1827, as part of a series of Acts repealing the death penalty for various types of larceny, the minimum value of goods stolen from a dwelling house in order for the death penalty to be invoked was raised from 40 shillings to 100 shillings. By revaluing the goods stolen to a level below this threshold, juries could avoid imposing the death penalty. The last time this verdict was used was in 1834. Until 1691 women convicted of stealing goods worth ten shillings or more were subject to a mandatory sentence of death (whereas men could claim benefit of clergy). By reducing the value of the goods below 10 shillings, juries could avoid imposing this penalty. A statute passed in 1691 allowed women to claim benefit of clergy on the same terms as men. This verdict has only been assigned to women convicted on a partial verdict of stealing goods worth less than 10 shillings before 1692. Defendants convicted of shoplifting goods worth 5 shillings or more after 1699 were subject to a mandatory death sentence. By reducing the value of the goods below 5 shillings, juries could avoid this statutory penalty. This verdict became redundant when shoplifting ceased to be a capital offence in 1823. This verdict reduced the charge against the convict to petty larceny, which meant that the defendant was punished by a fine, whipping, or, increasingly from 1718, by transportation. The elimination of the distinction between grand and petty larceny in 1827 rendered this verdict redundant. In some cases defendants pleaded guilty to only part of the charge made against them. Partial pleas occurred most frequently in trials involving more than one offence (such as forging and uttering, and stealing and receiving). In a negotiation that amounted to plea bargaining, a partial confession was offered in hope of being found guilty of a lesser offence. As with Pleaded Guilty verdicts, these increase in the nineteenth century following the declining use of the death penalty. In many cases, no verdict was given, or the verdict given was provisional, and the court chose to respite (postpone) its judgement. Occasionally, this was because a legal issue arose which needed to be debated by the senior judges at the Westminster Courts. In such cases, the jury ruled on the facts of the case, but left the judges to resolve the legal issues. Alternatively, the court could respite the judgement to await further information. In cases where special verdicts were returned the final judgement was deferred and the eventual verdict and punishment may have been reported in a subsequent edition of the Proceedings. 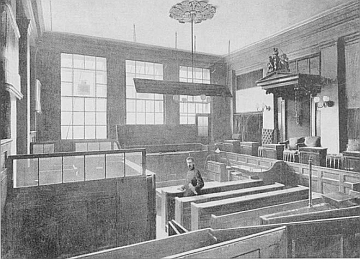 An Act of 1848 determined that such reserved judgements should be heard by the newly established Court for Crown Cases Reserved (later the Court of Criminal Appeal), which also offered the defendant the opportunity to claim that a legal error had been made during his or her trial. If unable to agree immediately, juries might retire to the jury room to deliberate. Until 1858 they were kept without fire, food or drink until a verdict was reached. The law's tactic of starving the jury into agreement meant that they rarely failed to come to a conclusion. After 1858 these verdicts became more common. In such cases, the jury was discharged and the defendant remanded in custody and retried at the next session. 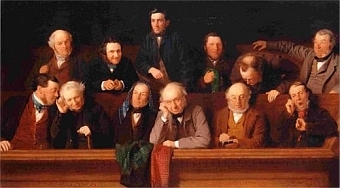 A verdict used from 1849 for trials which were postponed until a later date for practical reasons, most commonly the illness of a defendant, juror or short-hand writer. Most such cases appear in later editions of the Proceedings. A verdict used after 1822, and applied in those cases where a defendant was not fit to stand trial on the grounds of insanity (or other mental impairment). Defendants who were considered unfit to plead could be placed in "safe custody" at Her Majesty's Pleasure. This verdict is in its nature miscellaneous. It includes cases where: a defendant or jury member fell ill or died; the defendant was on bail and failed to appear; and where a jury was sworn to determine if a defendant was genuinely deaf and mute and hence unable to plead. If the jury believed the defendant was actually deaf and mute, they could return a verdict of "a visitation of God". Between 1790 and 1792 the Proceedings only include trials which resulted in guilty verdicts. This was because the City authorities feared that including other trials might lead readers might conclude that it was possible to commit crimes and get away with it. It was also feared that the detailed testimony recorded from trials where the defendant was found innocent might teach criminals techniques for avoiding conviction. These calculated omissions rendered the Proceedings much less appealing and useful to readers, and this practise was rapidly abandoned.